I love watching birds, and I especially like it when a bird catches your eye whilst out on your way somewhere, and looking for birds isn't your primary concern. 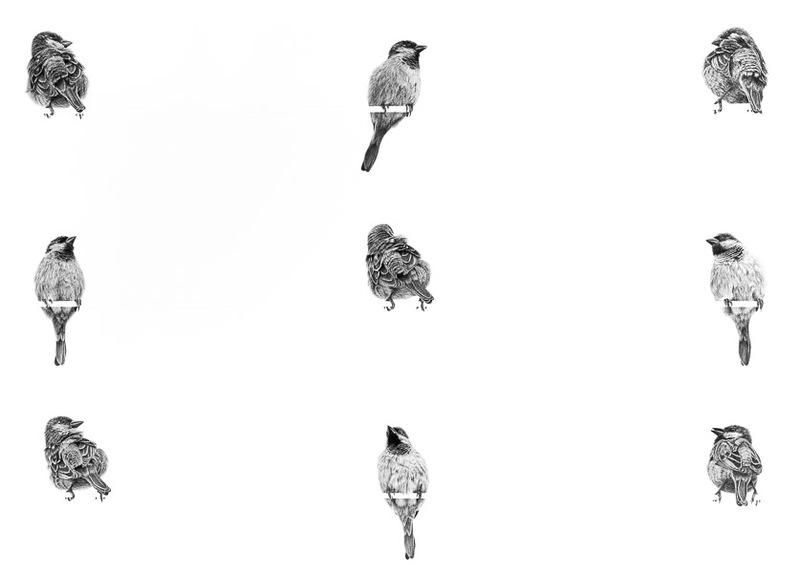 The sparrow in this image was on a telephone wire I pass under whilst walking my daughter to school. I decided this drawing needed 9 sparrows and when I imagined the patterns the nine would make across the image - an intersecting diamond and a cross - I got very excited about it. This drawing saw some changes to my usual methods. I decided to use a beautiful hot pressed watercolour paper instead of smoother drawing board; so I had to adopt an entirely new approach to my charcoal technique. I was very satisfied with the results and the paper helped me achieve a softness to the feathers with just the right amount of detail. I decided to show the deckled edge to the paper by float mounting the drawing in its frame. I was delighted to get third place with this drawing in the 'Best of the Best' awards at Art in Action 2015. An award chosen by the 400+ artists attending the show each year. The original drawing is available for £1500. Please contact me for details.